Lustrous, dark-green, persistent leaves and winter-to spring-occurring flowers make a common camellia shrub (Camellia japonica) a lovely addition to a garden. Unfortunately, Wisconsin's cold winters preclude their permanent use in outdoor gardens. Wisconsin falls in USDA Hardiness Zones 4 and 5, and the common camellia overwinters in zones 7 through 9. Display the shrub in a patio container and bring it into an unheated garage to overwinter by a window. 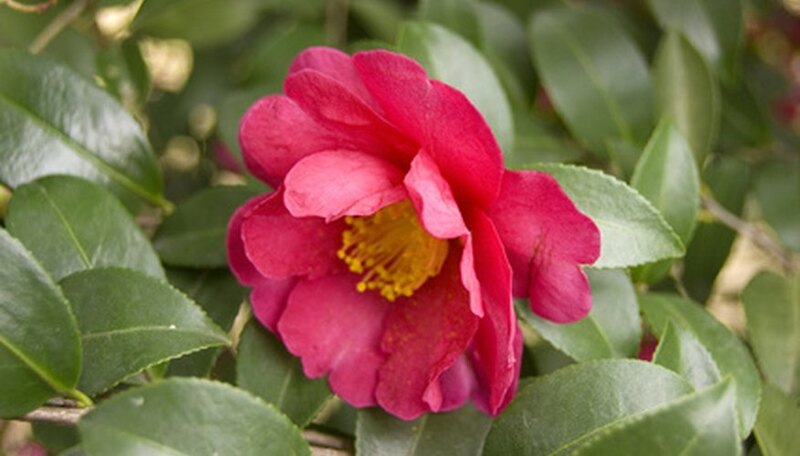 Find a common camellia variety you like at a plant nursery, and purchase it. Look for a plant label to learn of the expected flower color, or select it when you see it in bloom. Choose a plant that looks healthy with lots of foliage in a container no larger than 3 gallons in size, with a diameter that's 10 inches or less. Buy a decorative container with bottom drainage holes. Measure the container, to make sure your common camellia's root ball will fit into the decorative container with about 2 to 4 inches space to spare around the root ball. Purchase bagged peat-based potting soil, or a potting soil labeled for acid-loving plants. Place a rock or shard of bark mulch or broken terra cotta pot loosely over the drainage holes in the bottom of the planting container. Fill about 2 to 4 inches of soil in the container bottom, and set the camellia shrub atop the soil. Note how deeply the shrub would be in the container if you would plant it now at that depth. Once you remove the camellia shrub from its nursery container, you want the top of its root ball to rest 2 to 3 inches below the rim top of the decorative container. Adjust the soil level in the bottom of the container, so that your camellia will rest at the correct depth. Remove the container sleeve from the root ball of the camellia shrub. Gently scratch the root ball with your fingertips to loosen the roots, especially any encircling or dense roots at the bottom of the root ball. Place the root ball into the decorative container and situate it evenly upright and in the center. Begin filling potting soil around the root ball in the container, and tamp it down gently with your hand every time you add another 3 to 4 inches of soil. Fill the container around the root ball until the soil matches the top of the root ball and there is at least 2 inches of space from the top of the decorative container's rim. Water the newly planted camellia shrub. Apply enough water until it drains from the bottom holes. Add more potting soil if it settles after watering. Make sure the top of the shrub's root ball is at the same level as soil in the container. Sprinkle some well-balanced (10-10-10), granular slow-release fertilizer on the soil surface of the camellia shrub's container. Place the camellia shrub in a partially shaded location on the patio or garden where it will receive between 2 to 4 hours of direct sun daily. Bright indirect light or shifting dappled light like that under tall pine trees is ideal. Direct early morning or early evening sunlight rays suffice, too. Keep the soil in the container evenly moist year-round. Do not let it become too dry, and certianly not soggy or waterlogged. Apply a dose of acid-forming liquid fertilizer as part of a watering once a month, as long as the plant is actively growing and there's no danger of frost. Focus on this feeding in the months of May through September. Consider placing coffee grounds atop the container's soil to help maintain an organic-ingredient-rich, acidic soil for the shrub in the container. Bring the camellia indoors once temperatures in late fall or early winter drop below 20 degrees F. Allow the shrub to experience chilly nights in autumn, which helps coax flower bud development. Place the shrub in an unheated but windowed room in a garage or shed. The plant needs to be out of the cold winds and sheltered from Wisconsin winter outdoor temperatures below 15 degrees. The plant also must have bright light over the winter to remain alive. Monitor the soil moisture of the plant while overwintered in the unheated building. On days where the indoor temperatures in the building go above freezing, water the plant with cold water to keep the soil and roots moist. Expect water to drain out of the container holes. Bring the camellia container back outside in late winter, when nighttime temperatures will no longer drop below 25 degrees. In northern Wisconsin, that may be early April; in southern Wisconsin that may occur as early as early to mid-March. Expect flowers to open at this time of year until early May at the latest. Light frosts do not harm camellia flowers. Prune branch tips only after flowering ends. Reduce branch length early in spring, so new side growth and new leaves can sprout and mature over the short summer. Never prune past mid-summer as you'll likely remove developing flower buds, and young growth may be less tender to upcoming frosts. Choose a variety of common or Japanese camellia (Camellia japonica), as it is more cold-hardy than Camellia oleifera, Camellia reticulata, Camellia sinensis and others. Choose hybrids that have a label stating they are hardy in USDA Zones 6, 7 and 8, not ones grown in even warmer areas like Zones 9 and 10. As long as leaves remain green, you can increase exposure to sunlight since the summer sun in Wisconsin is not too intense when compared to more southerly regions in the United States. The more sun provided, make sure the soil remains evenly moist--never dry in the container. Do not grow your camellia indoors year round. These plants need a cool winter after a moist, warm growing season in order to properly develop, and open flowers the following late winter and early spring. Container-grown camellias can become heavy. Start with small plants, since they're easier to move. At some point, the camellia will need transplanting, or composting if it's too large and cumbersome to continually move around.